In the extreme cold of the Arctic, decomposers — the organisms that break down dead organic material — work a little differently and a lot more slowly than they do in other climates. There are a number of different kinds of decomposers. Scavengers, for example, eat dead animals. Detritivores are so-called because they eat detritus, meaning decomposing parts of plants and animals, or dung. Whatever decomposers eat, they are vital to unlocking the nutrients trapped in dead tissues and recycling it through the ecosystem. Due to the extremes seasons, Arctic climates cycle nutrients through decomposition a little differently when compared to other climates. However, the same players do most of the work: bacteria, invertebrates, big scavengers, fungi and lichens in particular. Saprotrophic bacteria are those that specialize in breaking down dead organic material. The Greek sapro- meaning "putrid" or "rot," and -trophic meaning "feeding" or "pertaining to nourishment." There are millions of different species of bacteria in the Arctic, each with their own specialty. Amazingly, the decomposer bacteria found in the Arctic soils are often the same as bacteria found on other areas of the planet. Bacteria don’t have internal heating systems like mammals do, so they depend on outside sources of heat to warm them up enough to do their job. This means that even though the same bacteria are present it takes much longer, sometimes years, for some materials to be broken down. Bacteria in the Arctic work in shorter and slower bursts in the colder climate. Usually invertebrates — like insects, earthworms, myriapods like centipedes and millipedes, and land-dwelling isopods like woodlice — are a big part of the decomposer picture, but in the Arctic, it is much harder for invertebrates to live. Millipedes and earthworms are some of the most common invertebrates breaking down plants in warmer climates, but these animals are completely almost absent in the Arctic. Instead, insects like carrion beetles and flies with maggot larvae break down dead animals. Nematodes, also known as roundworms, are also found in the Arctic. Arctic decomposers also include larger, scavenging animals. Any animal that eats meat can be a scavenger, but some are specialists. The most common are birds like ravens and gulls. Canids, members of the dog family like Arctic foxes, are also frequent scavengers on the tundra. Less common, but much fiercer, wolverines can sense a carcass under feet of snow and dig it up to scavenge it. Fungi are another important decomposer, and scientists have identified 4,350 different species in the Arctic. Of course, not all of these are saprotrophic, or specialized to break down dead material. With fungi, the first thing to come to mind is mushrooms, but mushrooms are relatively delicate, and don’t generally do well in the Arctic cold. For that reason, most fungi are found in filaments and mats — called mycelium — underneath the soil. These filaments grow inside a food source and then use enzymes to break it down, but as with bacterial decomposition, this happens very slowly. Other kinds of fungi, like slime moulds, are often found decomposing organic matter in arctic biomes. Fungi can also have symbiotic relationships that allow them to harness more energy. Lichens are a symbiosis between an alga or cyanobacteria and a fungus, and are a dominant life form in the arctic ecosystem. 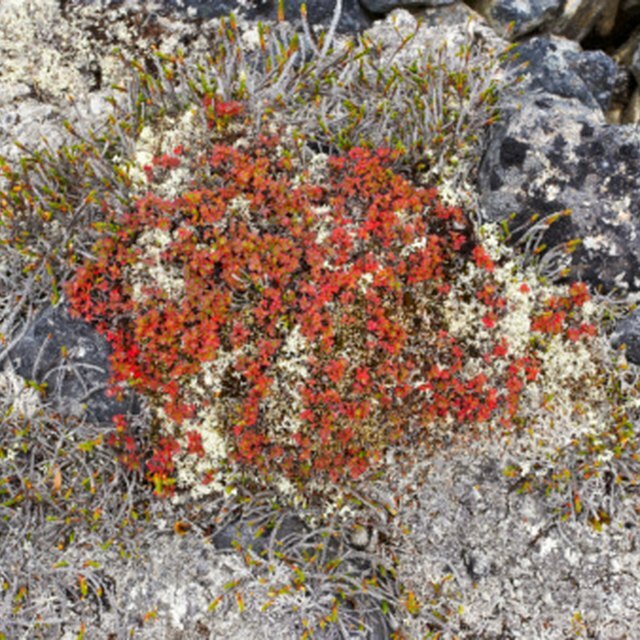 These complex and incredibly diverse organisms can behave in plant-like ways, but can grow in extreme environments like rock faces, making them the perfect kind of life for the barren arctic. The fungi-like filaments of lichen can grow into decaying material as a source of nutrition. How Are Bacteria a Part of Recycling & Biodegrading? Becker, Andrea. "Decomposers in the Arctic." Sciencing, https://sciencing.com/decomposers-arctic-8864.html. 17 April 2018.